De vez en cuando estira la cabeza y la gira como si saludara. Siempre sonrie. Available from Lhara at the darkmoon faire for 90 Darkmoon Prize Tickets the new currency for the updated Darkmoon Faire. 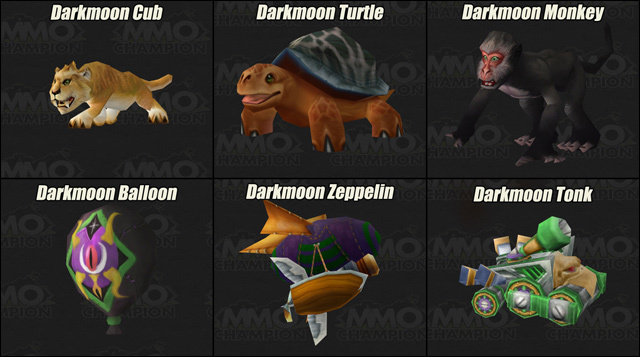 Each pet costs 90 x Darkmoon Prize Ticket and all can be purchased from Lhara. None of the pets have faction, level or reputation restrictions. This mount is available to people who are under level 20. Seeing how there is currently no level requirement to use the pet, this is the 2nd Perm. Mount that people under level 20 can use. Unlike the other two turtle mounts, this turtle does not seem to give a swim speed increase. I can bet there will be a few hunters that get this pet, fish up Tortuga marina and tame a turtle to have a turtle family like they do for the lovebird. This shelled reptile bravely protects the home on its back with an unwaveringly happy disposition. I got this from the reward bag after the Turtle ring toss game, is that rare or has it been changed for WoD? I got one out of a darkmoon prize from the turtle toss, so I named it after Dubenko. When I was originally farming the Darkmoon Faire during MoP, I got 2 pets to drop before I had all mounts and pets, which was nice because it saved me 180 Vale de la Luna Negra. More recently, I have done quite a few additional things at the faire, including earning all of the achievements, buying various heirlooms, and farming up almost all of the 1000 tickets for the Dirigible de la Luna Negra without seeing a single pet drop, so I thought that maybe the pets could no longer drop from the daily quests. The pets also no longer seem to have a "Contained in" tab on wowhead, which suggested that it might have been changed. I could not find information on wowhead or elsewhere to confirm one way or the other, though. However, today, I received Cachorro de la Luna Negra from a Premio de juego de la Luna Negra, so I thought I would post here in case anyone else has had the same question. Darkmoon Island, Let the Adventure Begin!! !